The complete solution for your 2012 - 2015 27" iMac: OWC's in-line solution is the only hardware digital thermal sensor on the market allowing a third-party SATA drive to be installed in your iMac. A convenient, plug-and-play cable, the In-line Digital Thermal Sensor eliminates fan noise and maintains proper system fan control through the iMac's System Management Controller, requires no software hacks and ensures compatibility with Apple's built-in diagnostic processes. The AdaptaDrive doesn't create a bottleneck or any performance throttling, it delivers pure data pass-through performance and drive use convenience from any 2.5" SATA 1.5Gb/s, 3Gb/s, or 6Gb/s hard drive or SSD. 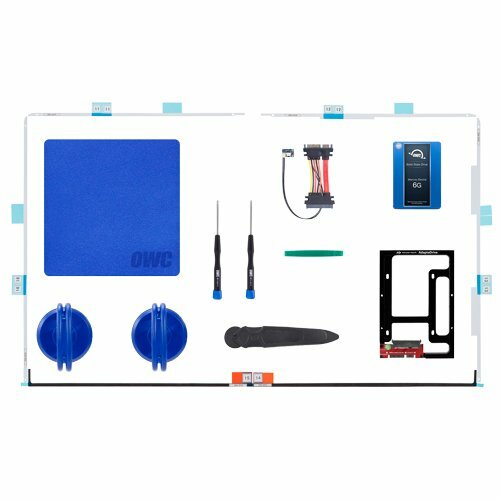 OWC 2.0TB Aura Pro 6G SSD and Envoy Pro Upgrade Kit for 2012-2013 MacBook Pro with Retina display.